The AquaSox Frog Blog will keep you updated all year long on the Everett AquaSox, short-season single-A affiliate of the Seattle Mariners! 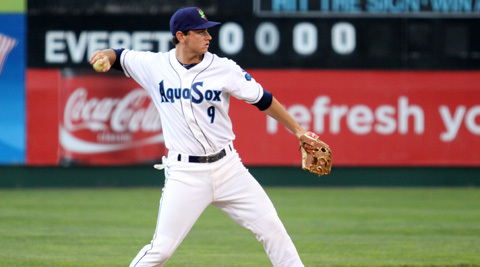 AquaSox shortstop Marcus Littlewood became the highest position player drafted out of the state of Utah when the Mariners took him with the 67th pick in the second round of the 2010 Draft. He spent the first portion of the 2011 season with the Clinton Lumberkings, where he he collected 15 hits and a homer in 27 games. Since he has been with the Frogs he has started 17 of the first 20 games of the season at shortstop, where he has recorded the second most hits (17) and runs batted in (8) on the team. The Frog Blog sat down with Littlewood to see what drives the captain of the infield. What has been the biggest adjustment since being drafted and playing in the minor leagues from high school? I would say playing every day, and also living on your own. I was fortunate to have experience kind of living on my own living with my grandma in Salt Lake City last couple summers to play up there. But the biggest thing is playing everyday and having to forget the day before. In high school and even in summer ball you could dwell on the last week and you would be fine, but this is a totally different mental game. That has been a big adjustment for me. Marcus Littlewood makes a play on a grounder against the Vancouver Canadians. You decided to go straight to the majors out of high school instead of going to the University of San Diego. What was the deciding factor in that decision? That was a really tough decision because education is really important to me. But the deciding factor would really have to be the signing bonus offer that was made to me on draft day. It was kind of a no-brainer, kind of had to do it. From there I haven’t been happier with the decision that I made. What was your initial reaction when you saw you were drafted? Take us through that day. I was hoping to go with the first pick with the Mariners, so that was sort of a rollercoaster of emotions not being picked the first day. I was kind of down, but if I had to go through it again I would go through it with no expectations. That is the advice I would give to any player that is getting drafted. The next day me and my family were all sitting around the computer and the picks were going, it seemed like a blink of an eye they were going really fast. So the Mariners came up and they call my named. There were hugs going around the room, and it was such a relief. I knew it was big when it happened because it was the highest position player picked out of Utah, so I felt really good about that like I was setting a bar high for the future. What would you say your biggest strengths are as a player? What are some things about your game that need to be improved while in the minors? I would say my biggest strength is probably on the mental side and being even-keeled. Everybody has ability and everybody has strengths, but it is the mental side that really sets you apart. Things I need to improve on, I would say my overall game. I think everything can improve and I know it will improve as I mature and I get stronger and get older. I can already see how I have improved since I signed. What is your proudest achievement in baseball outside of being drafted? Winning the gold medal with Team USA’s 16 and under team in Mexico. That was my first time ever going away from my family, which was only like three or four weeks, but that was a long time when I was 16 years old. That experience with USA baseball was awesome. We got to play in front of a couple thousand, which was huge for me at the time. Being stuck under the bottom of that dogpile when we won and being suffocated was awesome. Do you feel any added pressure being the highest draft pick on the AquaSox roster? It doesn’t really matter to me because nobody on our team really cares. We are all on this team for the same reasons which are to win a ring, get better and move on to the big leagues. So it doesn’t matter where you got picked. What is your favorite non-baseall activity you like to do to unwind and take your mind off baseball? After the games I usually have a TV show that I watch on my computer. I watch “The Office” before I go to bed every single night, I have done that for the last eight months probably. It is my favorite TV show, because it brings me back down to Earth. That may sound weird, but it is the truth. What are your goals for your first full season in the minor leagues? Just to get better every day. I have never been a guy who has stats set in stone that I want to achieve because if I put together quality at-bats the numbers will take care of themselves. So my goal is to simply feeling like I am getting better every day, and hopefully I will put together some good numbers. So in our last post we gave you a few dates to mark on your calendar leading up to the season… now it is time to send out the official invite to FanFest 2011! FanFest is a FREE event marking the first day of single-game ticket sales, and has expanded every year to become a great event for fans and families to celebrate the start of the season. 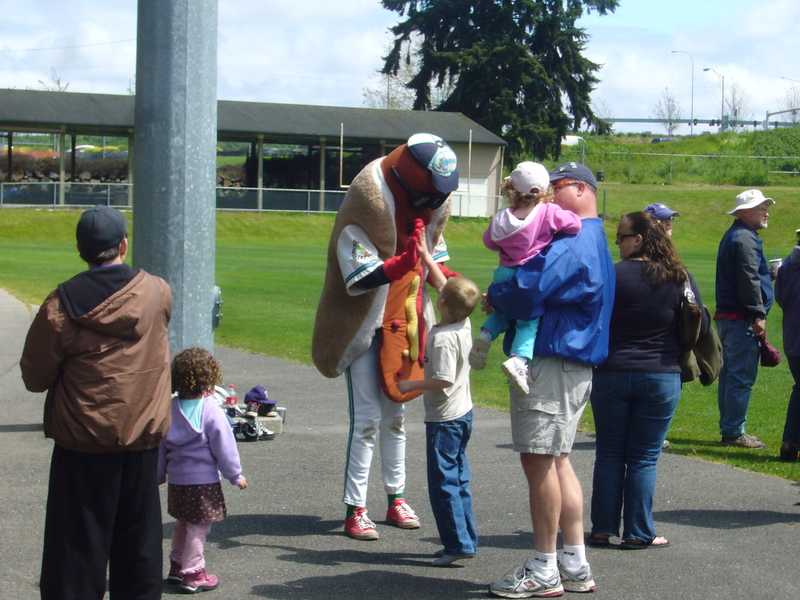 This year, FanFest will be on Sunday, May 22nd from 11am-3pm at the ballpark (3800 Broadway, Everett). Fans can visit the stadium, check out their seats, meet the AquaSox staff and mascots, take batting practice on the field, and of course sample some of the concession offerings for the upcoming season. Other events at FanFest include our National Anthem auditions (to register for a time slot, give us a call at 425-258-3673), inflatable games up in the FunZone, a Game Day artwork contest for kids. Plus the team store is open for ticket purchase and will have new merchandise available as well. We are always up for suggestions from fans on what you would like to see at FanFest (or at the ballpark for that matter) so email us with your ideas at info@aquasox.com. And for those of you who love to be the first to snap up the best seats – there will be an online pre-sale of tickets at http://www.aquasox.com starting on Wednesday, May 18th. Look for more details as we get closer. The AquaSox pushed their 2010 season as far as they possibly could, beating the Spokane Indians for the NWL title on Sunday, September 12th, less than 12 hours before their bus left for SeaTac and their flights home. Since that day AquaSox Nation has spent their off-season soaking up the first championship for the franchise since 1985 and the first since the AquaSox changed their name from the Everett Giants and became an affiliate of the Seattle Mariners. There are championship shirts, championship hats, and the Freitas Cup travels to events with Webbly & the AquaSox staff so fans can get a glimpse of the elusive trophy. 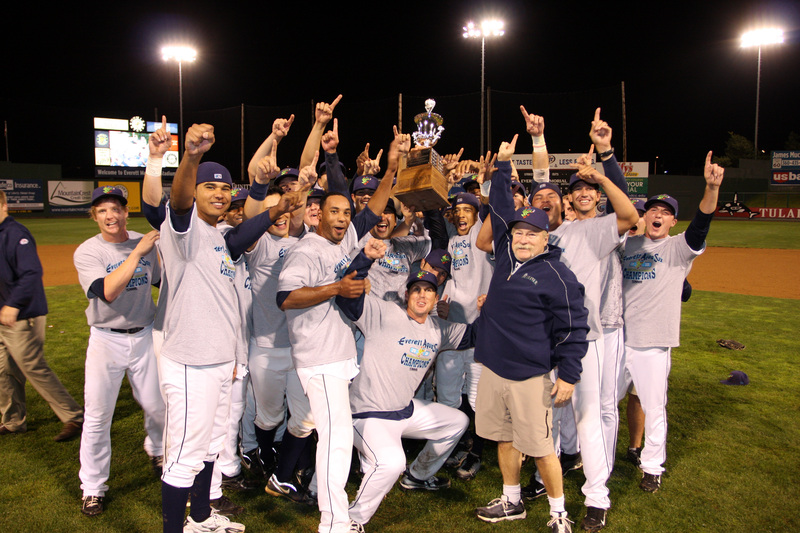 The players, coaches and front office staff have their championship rings, the plans are underway for a championship celebration on Opening Night 2011, and you can watch the final pitch and celebration on the AquaSox YouTube page. And while the luster of the NWL Championship hasn’t worn off, fans, players and staff are ready to get 2011 underway and have baseball back at Everett Memorial Stadium once again. Full-season Minor League teams get underway this week, and it is officially time to wait impatiently for AquaSox Opening Night on June 22nd. Luckily, we’re not planning to sit around waiting for first pitch – we’re ready to get the festivities underway! Last night was our Mariners Kick-Off party at Tulalip Resort Casino, and we had a blast with our ticket holders, sponsors and host families. We have several other ticket-holder only events coming up including our Ticket Pick-Up Party and our Meet the Players BBQ, so if you have a ticket package, keep your eyes peeled for all the details. – Saturday, April 16th, 12:00-2:30 – AquaSox Job Fair. We hire all of our day-of-game workers through this job fair. If you or someone you know is interested in working in concessions, ticketing, promotions or stadium operations, give us a call for more information at 425-258-3673. – Wednesday, May 18th – Online Single-Game Ticket Pre-Sale. While season tickets and mini-plans are available online now, single game tickets will go on sale at http://www.aquasox.com starting on Wednesday, May 18th. 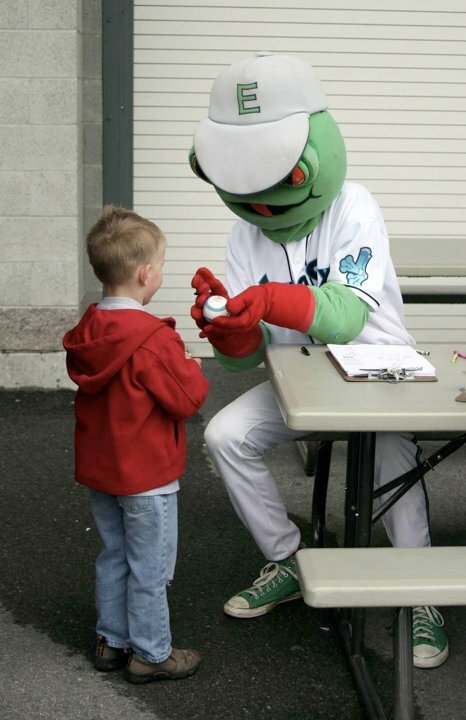 – Sunday, May 22nd, 11:00-3:00 – AquaSox FanFest. Free to the public, AquaSox FanFest is a great way to get ready for the season. Ticket sales begin in our office, we host National Anthem auditions, our Game Day magazine art contest, concessions are open, fans can play on the field, check out the dugouts and much more. Anthem audition info will be posted in mid-April, as will all the details for FanFest. – Wednesday, June 15th, 7:05 – Everett Cup vs. Everett Merchants. 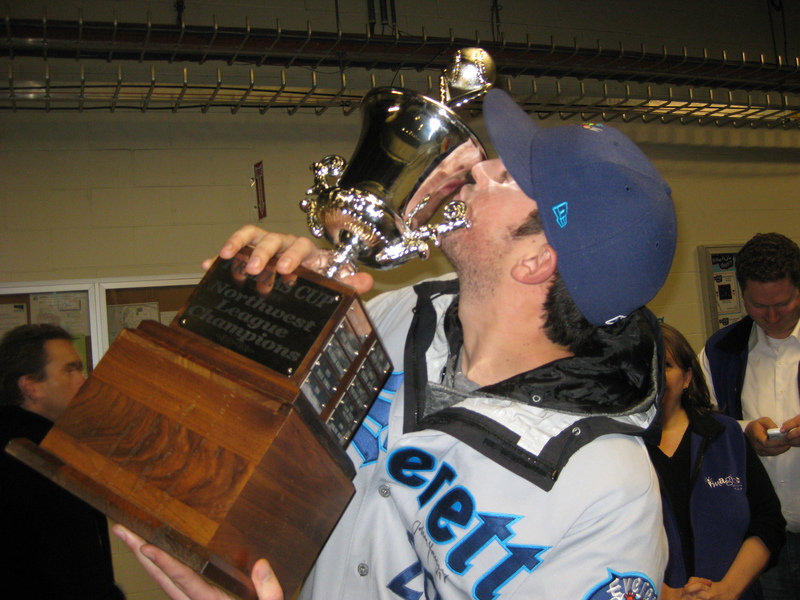 The annual Everett Cup is a great way to kick off the season as the AquaSox play the Everett Merchants for pride and the ability to claim that they are the champs of Everett Memorial Stadium. Tickets start at $8, and are included in the Silver Sluggers package for the first time this year. We will have more events and announcements as the season gets closer, and it is never to early to sign up for Silver Sluggers, Kids Club, Baseball Camp, Ticket Packs and all of our community initiatives. Bookmark http://www.aquasox.com to keep on top of all our upcoming events. Since it always gets us ready for Game Day, we’ll leave you with our 2010 Intro Video – We are AQUASOX! While you’re waiting for AquaSox Opening Day, don’t forget that many of your favorite AquaSox have moved up in the organization and are now with the Clinton LumberKings, High Desert Mavericks, Jackson Generals and Tacoma Rainiers .